Earlier, in August 2015, the team of archaeologist Maria Kamisheva from the Stara Zagora Regional Museum of History discovered a marble slab from the frieze of an ancient temple in Augusta Traiana depicting two fighting gladiators as well as herms and an inscription mentioning Roman Caesars. 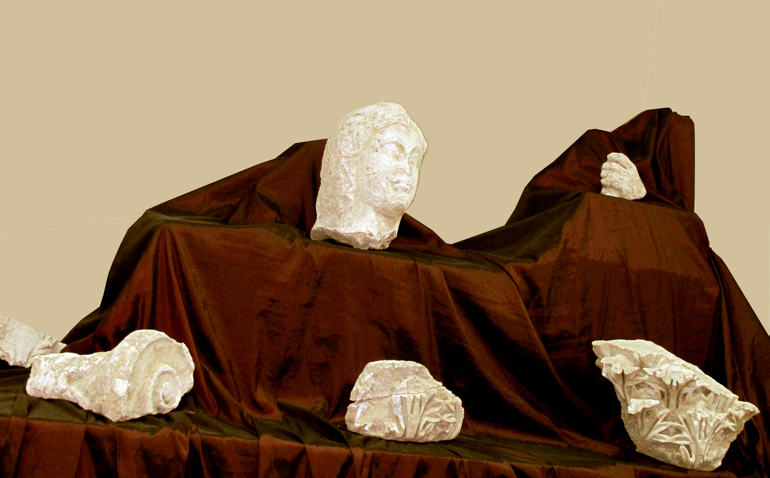 The marble head from a gladiator statue has been found on the same spot as the marble slab with the fighting gladiators’ relief; its discovery was announced during the recent Night of the Arts held at the Stara Zagora Museum when it was also shown to the public for the first time, reports the Bulgarian daily Monitor. In addition to showcasing the marvelous gladiator head, the archaeologists in Bulgaria’s Stara Zagora have announced they have deciphered the second inscription that they found at another archaeological site located about 50 meters away from the excavations of what was a Roman temple. Not only does this second inscription reveal that the temple in question was dedicated to the ancient deity Hermes, but it also indicates that the Roman city of Augusta Traiana had a stadium as well as an odeon, an Ancient Greek and Roman public space for musical and theatrical performances and competitions. “[he] furnished the columns (the portico of the temple) of Hermes all the way to the wide street leading up to the Odeon at his own [expense]". As mentioned above, this second inscription was discovered engraved into the architrave of a portico found during the 2015 summer rescue excavations by the team of archaeologist Maria Kamisheva. According to archaeologist Dimitar Yankov, one of the researchers who has spent decades studying the Ancient Roman city in Bulgaria’s Stara Zagora, the inscription is clear-cut evidence that Augusta Traiana had a stadium and an odeon. He also points out that there are indications that the Roman city in question had a gymnasium, an ancient training facility for competitors in public sports games. “There are many pieces of evidence that the city had a gymnasium… The [sports] contests were held at the forum at first but later these events were moved to the north where a stadium was built," Yankov is quoted as saying. He adds the stadium of Augusta Traiana might have been located close to the temple of god Hermes, whose ruins the archaeologists excavated over the summer, since Hermes was deemed a patron of traders and athletes. The odeon of the Roman city of Augusta Traiana might also have been located near the temple of Hermes but no conclusive evidence has been found for its location. Several decades ago another Bulgarian archaeologist, Prof. Dimitar Dimitrov, documented two marble slabs from Augusta Traiana decorated with dancing bacchantes from the company of god Dionysus. However, back then the slabs were turned in to the museum without information as to where exactly they were found which leaves the existence of an odeon in Stara Zagora still a hypothesis, and its location – a mystery. A similar motif but of “Silenus with Bacchantes" can be seen in detail in a 4th century AD Late Roman mosaic which was recently restored and made accessible to the public in Stara Zagora. Odeon is the name for a public Ancient Greek or Roman building built for musical and poetry shows and competitions. The word comes from Ancient Greek, and means “singing place" or “building for musical competitions". The first Odeon was built in Ancient Sparta around 600 BC. Three Ancient (Roman) Odeons have been discovered in Bulgaria so far – in Philipopolis (Plovdiv), Serdica (Sofia), and Nicopolis ad Istrum in Northern Bulgaria. It is believed that the Plovdiv Odeon was first used as a bouleuterion, a building for the council of citizens (boule) in ancient city-states (poleis), but was later used as a space for theatrical performances.